SAN FRANCISCO (CBS SF) — For years, I’ve covered the debate over chemical flame retardants in consumer products and my professional research has often impacted the decisions I make at home. For instance, long before my daughter was born, I replaced my couch cushions with flame retardant-free foam on TV for a consumer story on California’s changing flammability standard. While pregnant, I reported on how to detect flame retardants in baby products and then went out and bought the recommended mattresses, changing pads and nursing pillows, and basically rid our home of polyurethane foam. By the time my daughter was born, we believed our home was largely flame-retardant free aside from the electronics. So imagine our surprise when a bio-monitoring study for an unrelated story revealed extremely high levels of the flame retardant TDCPP in my two-year-old. I’d just reported on another form of that chemical (TCPP) in certain models of my daughter’s high-end “green” car seat and I had already sent away samples of the foam from her infant and toddler car seats for testing. 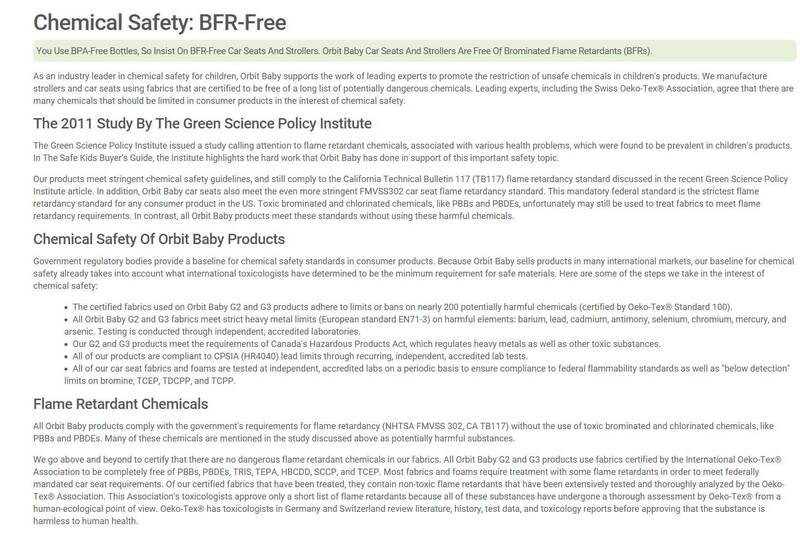 The Orbit Baby car seat-stroller system retailed for over $1000, in part because the company claimed its materials were tested to ensure “below detection limits” of “dangerous flame retardant chemicals” including TDCPP and TCPP. I’d featured the “green” car seat in several news reports over the years and even spoke with the company’s founder. In the NewsMom blog that was the genesis for the December story, I explained that Orbit admitted it had switched foam manufacturers at some point, but I was still hopeful that my daughter’s car seat was unaffected. The day after we received my daughter’s bio-monitoring results, we received the results from the foam sewn into in her car seat’s head rest and “Orbit Green Certified Fabric.” Ultimately three independent labs confirmed the car seat’s foam tested positive for TDCPP. “TDCPP has been clearly shown to cause cancer,” said Dr. Martha Sandy, a toxicologist and Chief of the State’s Reproductive and Cancer Assessment Branch for the Office of Environmental Health Hazard Assessment. Dr. Sandy explained that a team of scientists reviewed decades of research in humans, animals and cells before adding TDCPP to California’s Prop 65 list of known carcinogens. TDCPP was removed from children’s pajamas in the 70s due to health concerns, though it was only added to the Prop 65 list in 2011. Like most flame retardants, TDCPP does not stay in the product and kids are more susceptible to the harmful effects of chemical flame retardants because their bodies are still developing. Kids are also more likely to ingest the chemicals which migrate into dust due to normal kid behaviors like hand-to-mouth contact. For perspective, the levels of the metabolite for TDCPP in my body were 3.8 parts per billion (ppb). That was lower than the average child in previous studies which ranged between 5-7 ppb. However, my toddler tested positive for more than 60 ppb! From the Green Science Policy Institute, to the Environmental Working Group, to toxicologists with the state’s Office Of Environmental Health Hazard Assessment, everyone who saw my daughter’s results were shocked to learn that they were so high. The results were especially surprising because mine were so low and we live in the same home that we’d largely rid of chemical flame retardants. My daughter does not attend day care yet and spends most of her day in the home so she is not regularly exposed to external sources of TDCPP outside the home. However, I am. Those were obviously terrifying results for any parent, but Dr. Sandy tried to alleviate my greatest fears. She explained if someone ingested 5.4 micrograms of the chemical every day, over a lifetime, their cancer risk would be 1 in 100,000. The bad news is that it’s just one of the concerning chemicals that we’re exposed to every day and the combined effects are unknown. However, the good news is that TDCPP doesn’t stay in the body for long once you eliminate continued exposure. Before publicly reporting our results, I wanted to give Orbit the benefit of the doubt. Twenty-four hours after receiving the test results and getting rid of the car seat, we took another sample from my daughter. We followed up with a third sample 10 days later in an effort to confirm that nothing else in the home was significantly contributing to the exposure. According to Duke University’s Dr. Heather Stapleton who has performed several similar bio-monitoring studies, the half-life of the TDCPP metabolite is about 8 hours. In other words, every 8 hours the amount of the chemical in your body should reduce by half. All else the same, my daughter’s levels went from 60.08 ppb while she was using the car seat to 8.68 ppb about 24 hours after her last exposure to the seat. They dropped further to 4.25 ppb 10 days later. The follow-up samples were taken at the same time of day. “I think it provides a great natural experiment,” Dr. Sandy said after hearing about our test. She explained similar scientific tests like this are rare because it is not ethical (or likely legal) to purposely expose children to a known carcinogen in order to find out how it affects their bodies. Dr. Johanna Congleton, senior scientist at the Environmental Working Group agreed. It is important to note that all car seats currently have flame retardants. While some flame retardants are believed to be safer than others, a recent technical report by the Ecology Center found concerning chemicals in 75% of the car seats tested. “A car seat is the only product that you as a parent are required by law to purchase,” said Julie Vallese of the Juvenile Product Manufacturers Association. Manufacturers would like car seats to be exempt from the National Highway Traffic Safety Administration’s federal flammability standard, which manufacturers say currently requires them to use flame retardants in car seats. Car seats must meet the same flammability standards as the interior of the car itself, yet many fire scientists, consumer groups, and manufacturers argue that there is no evidence that indicates flame retardants in car seats actually protect children in a fire. If a fire has managed to burn though all the other flame retardant coverings in a vehicle, they say the foam under the child is largely irrelevant. The Juvenile Product Manufacturers Association points out that this is a very big, but a very new development and it could take years before chemical free car seats actually make their way to the market. However, similar changes to flammability standards for furniture resulted in almost immediate access to flame retardant-free furniture. In the meantime, Dr. Sandy recommends washing your child’s hands whenever they get out of the car, and cleaning and vacuuming your car seat regularly. Dr. Sandy, along with the American Academy of Pediatrics and the Consumer Product Safety Commission, also urge parents to leave the car seats in the car and never use them as stroller seats or allow infants to sleep in a car seat outside of the car. For more on how to reduce exposure and research car seats with safer chemicals, see this NewsMom blog post. You can also have a sample of your car seat tested for free through the foam testing program at Duke University. NOTE: Car seats in cars save lives. None of this information should be interpreted to imply otherwise. The safest place for a child in a moving vehicle is in a rear-facing car seat in the middle of the back seat. An early version of this online text implied a replacement car seat was purchased and used immediately after the positive test. As accurately stated in the broadcast story, the Orbit car seat was immediately “removed”. However, the replacement was not purchased until after the first follow-up bio monitoring sample was taken and was not being used until after the second. Additionally, as the quote from Dr. Sandy later implied, the replacement car seat purchased prior to the interview was widely believed to be TDCPP-free. We recently received lab results indicating that it also tested positive for TDCPP.